At just four years old, Alan Block was riveted by the 1960 presidential nominating conventions and debates. In second grade, he volunteered to be a mock trial prosecutor. And when he was nine, his favorite movie was Inherit the Wind. Even as a child, it was more than evident that he understood the power of words and how they could affect the course of events. The power of advocacy—and making it effective and available to clients—has been a reoccurring theme in his career ever since. After graduating from Boston University School of Law, Block returned to New York and became director of litigation for the city’s board of education. The position provided early experience in arbitration and the courtroom, and put him at the forefront of developing new laws pertaining to services for special needs students. 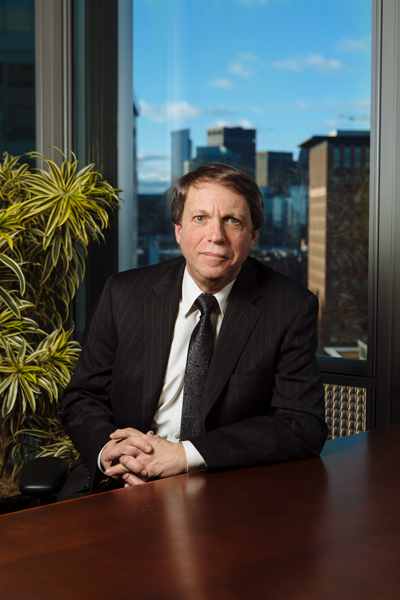 His dedication to advocacy led him from the public sector to several private firms, Wall Street, and eventually to John Hancock, where he currently serves as vice president and chief counsel, director of litigation, ADR, and bankruptcy. Since 1998, he has worked to develop exceptionally close ties with the company’s business units, ensuring that the litigation department is a trusted and fully integrated partner. When it comes to effective advocacy, much of Block’s approach is based on litigation management strategies he helped to pioneer while in private practice. He worked for three years with consultants from Booz Allen Hamilton to apply business management best practices to management of about 100,000 litigation cases nationwide for one client. By centralizing data, standardizing tasks, developing settlement matrices, and applying stringent controls on outside counsel activities, Block successfully reduced the client’s annual litigation spend by millions of dollars with no measurable decrease in favorable outcomes. He implements the same strategies with respect to John Hancock’s far smaller caseload. Objectives are prioritized over process to identify key drivers of desired leverage points and outcomes, and to ensure that spend is concentrated on those drivers. “Deciding what not to do can be tough. But those are the kinds of calls in-house counsel are paid to make,” Block says. He also places a great deal of emphasis on selecting and managing outside counsel. This includes establishing alternative fee agreements, ensuring firms downstream work to cost-effective personnel, requiring authorization for specific tasks, and closely monitoring billing data. Block is also consolidating the number of outside firms. This creates a smaller group of subject-matter expert firms that are intimately familiar with the company, its personnel, processes, and records. Efficiencies result from not having to educate counsel and by honing proven documents and strategies to continually improve the work product. When asked if there is anything he would change, Block believes there are always factors to improve. “But the key to our success is maintaining trust and an ongoing dialogue with our business colleagues,” he explains. As part of his dedication to advocacy, Block has worked with student mock trial teams and appears as a mock trial judge at his alma mater. “I try to impress on students that our court system is a treasure that most often gets things right—even if not always at the trial level,” he says.